The FTSE ended marginally lower on Thursday as Brexit’s extension has implied further economic uncertainty in the UK. Securing the delay had little impact on the sterling suggesting markets have priced in the extension and the unlikelihood of a no-deal Brexit. Now it is up to parliament to find a resolution within the next 6 months and the uncertainty may weigh on the domestic currency and leave room for further advances on the FTSE. Moreover, with global central banks taking a cautious stance with regard to monetary policy, global growth concerns has kept markets on the sidelines. Direction on the FTSE may take cues from Wall Street today following the release of earnings reports. 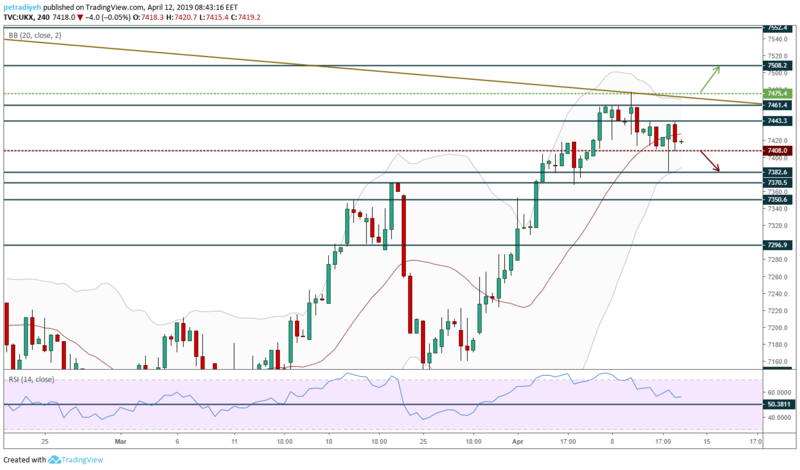 The FTSE’s uptrend remained on pause as the price failed to trade above the minor resistance at 7440 on Thursday and drifted lower towards the 7380 level before ending at 7417. Since reaching the trend line resistance from May, price has been drifting lower, however holding below the 7420 level is required to signal bearish price action towards support at 7370 while a move above 7440 would indicate buying pressure and a re-test of the trend line resistance around 7460/7470. The RSI reading has maintained above the mid-line and shows we remain in positive territory whilst within ranging period suggesting impending direction.